Genghis Frog is one of the Punk Frogs. He was a humble, naive tadpole, until he was accidentally mutated, then tricked by The Shredder to join his cohorts for evil purposes. When he saw Shredder’s evil ways, Genghis realized that the Turtleswere his true friends. Now this radical amphibious leader of the frogs is showing everyone his true colors. He’s a sewer-surfin’ fool and courageous dude who doesn’t mind ridin’ the waves to splash the Foot. Undaunted by the fear of croaking, Genghis Frog arms himself with his Tongue Gun to lick the evil Shredder. 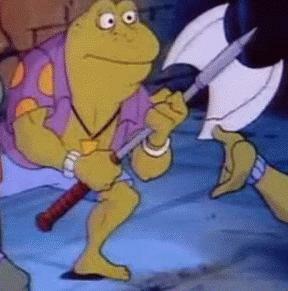 Riding his Radical Razor-sharp Boogie Board, this frog’s ready to cut the Foot Clan to rib-bits. He first appeared in the 1987 series, in the episode Invasion of the Punk Frogs. He makes a brief cameo in the first episode of Mutant Turtles: Chōjin Densetsu Hen. Genghis was named after one of Shredder’s “personal heroes”, namely, Genghis Khan. Genghis was one of only two Punk Frogs to be officially released as a toy by Playmates. The other wasNapoleon Bonafrog.